Godzilla is coming! 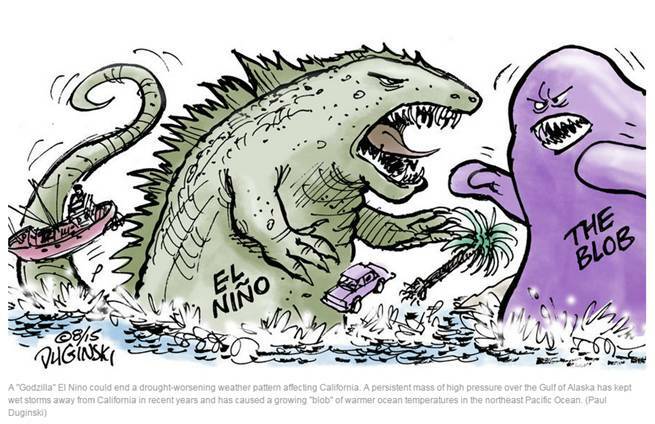 In the past 10 days or so, the impending El Niño has been universally dubbed “Godzilla” because it is being forecast as the largest (or almost largest) such event in 50 years or more. The Global Language Monitor has added a new usage of “Godzilla” to the English Language Lexicon because of all this, and Your Dictionary has added a second definition to their Godzilla entry. To give credit where it’s due, here is Bill Patzert at NASA’s Jet Propulsion Laboratory who appears to have coined the phrase. The coverage is very much focused on what types of weather we can expect in the autumn and winter from this year’s El Niño. Speculation is rampant on what California will experience, and almost every city in North America has a local look on what might be coming. Floods, droughts, warmer weather, colder weather, blizzards – it’s all there, depending in where you look on the continent. And it’s all reasonable…at least as reasonable as anything described as “Godzilla” can be. By comparison, there is limited coverage on the current effects of the same Pacific weather configurations. Asia has seen a “typhoon flashmob,” and Ela was the earliest storm to ever form in the Central Pacific storm season. Taiwan and China have been pounded by typhoons, and more is on the way. Closer to home, the current wildfire season is setting records across the Pacific Northwest and in Canada. Tragic fires are destroying homes and killing firefighters, with Washington having a particularly bad year. The fact that many of these destructive fires have been caused by people is infuriating (and criminal), but the fact remains that the weather has been conducive to wildfire in that region. El Niño is more than heavy rains, indeed. As insurers, including the NFIP, prepare for rain in California in the coming months, I wonder if they were readying themselves for this wildfire season six months ago – the analytics for the USA were there. In the meantime, though, I’ll hope for wider adoption of wildfire models because they are valuable to insurers, and therefore, to homeowners exposed to this Godzilla-esque peril.